In Traditional Chinese Medicine (TCM), rheumatoid arthritis is called “painful obstructive syndrome”, or bi syndrome. by Dongfeng Zhou, AP, and Sara Allen, AP – Arthritis is the inflammation of joints. In Traditional Chinese Medicine (TCM), arthritis is called “painful obstructive syndrome”, or bi syndrome. There are underlying causes to this painful obstruction which herbs can treat and thereby help the disease. 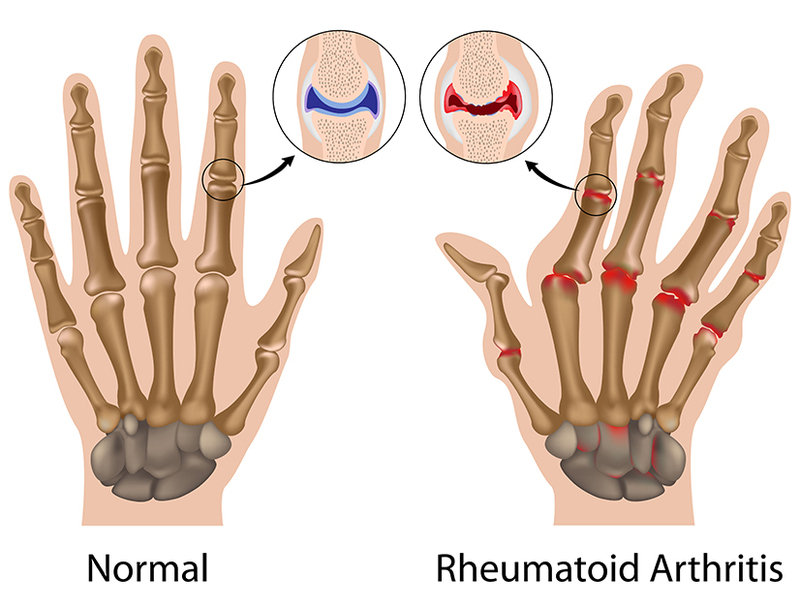 Rheumatoid arthritis is characterized by joint pain with warmth and swelling that comes and goes, which is an autoimmune response to stress, diet, or other infections. Typical presentation begins in the hand joints that affects both hands or fingers in the same joint. This autoimmune response is the body attacking its own joint and bone tissues, causing pain and, eventually, deformation of the joint. Rheumatoid arthritis (RA) is particularly difficult to treat with allopathic or Western Medicine and usually involve anti-inflammatory and steroid medications to calm down the body’s attack on its own tissues. The word Rheumatoid Arthritis in Chinese is translated as “wind and damp” arthritis. Both wind and damp are underlying causes of RA. The “wind” introduces the pathogenic factor which becomes internalized in the body and lodges in the joints. The internal “damp” is the swelling of the joints caused by excess interstitial fluid which does not move properly. This stagnant body fluid causes painful obstructions and triggers the immune response. This dampness usually accumulates because the body has internal cold issues which slows down circulation. When the obstruction accumulates enough, the painful obstruction will cause heat in the joint because the immune system errantly tries to fix the problem by bringing more blood to the area, which only causes more painful obstruction with more swelling and redness. 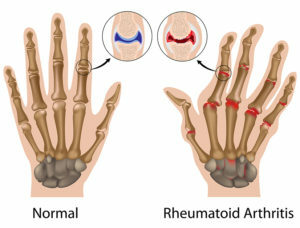 This is characterized as the acute or flare-up stage of RA, while the swollen, achy joint without the redness is more chronic stage. There are several helpful herbal formulas used to treat RA. The major formula for treating RA is Gui Zhi Shao Yao Zhi Mu Tang. It is included in the ancient text Jin Gui Yao Lue, written around 200 B.C. It is specially formulated to treat the wind-cold-damp painful obstruction perfect for the chronic stage of RA with painful, swollen joints, and shortness of breath, dizziness, or nausea. The primary herb in this formula is Sheng Jiang, or fresh ginger, which helps warm the body and dissipate excess fluids. There are four secondary herbs in the formula: Gui Zhi (cinnamon twig), Zhi Mu, Bai Zhu, and Fang Feng. These work together to move the formula to the extremities (hands and feet), disperses excess fluid and cold from the joints, and harmonizes the formula. This formula can be used long-term and can also be used during the acute or flare-up stage of RA. In modern TCM research, it has been proven to treat psoriatic arthritis, gouty arthritis, and lupus. Two other formulas worth mentioning are Dang Gui Nian Tong Tang and Shang Zhong Xia Tong Yong Tong Feng. 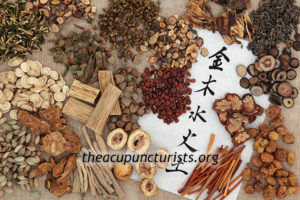 Dang Gui Nian Tong Tang is used especially during the flare-up or acute stage of RA to reduce the hot, swollen joints. A patient using this formula would have a rapid pulse and a red tongue in addition to the joint problems. Shang Zhong Xia Tong Yong Tong Feng is a great formula for treating gouty arthritis, but not the right one for the acute stage of RA. There are a few key herbs often used for Rheumatoid Arthritis. Chuan Shan Long is the most important herb for chronic pain and arthritis. The chemical component saponin has an anti-inflammatory action similar to cortisol, the body’s natural steroid. It is ideal to combine with other “wind” herbs to promote blood circulation and relieve pain. Because Chuan Shan Long has no noticeable side effects compared with steroid medications, this herb is used as an herbal replacement of steroid in China. The popular herb Jiang Huang, better known as Turmeric, contains curcumin, a powerful and safe anti-inflammatory and analgesic for sports injury, musculoskeletal trauma, inflammatory bowel disease, arthritis, and rheumatoid arthritis. 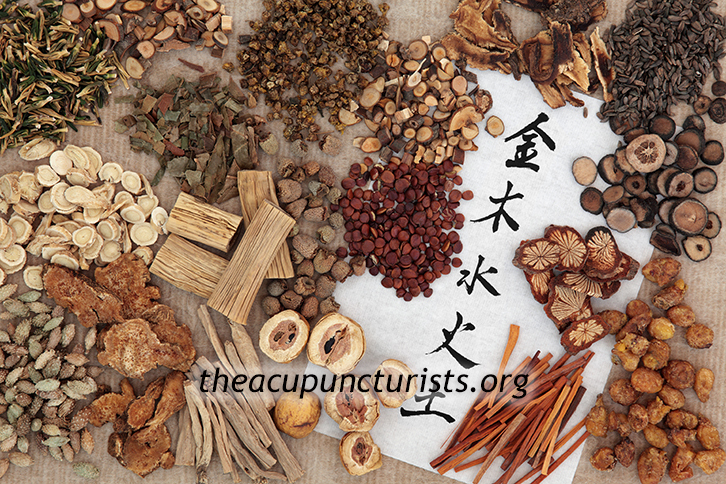 In TCM, Jiang Huang is usually used for pain and arthritis in the upper body. Although it is considered food-grade herb, one must be aware that a large quantity of Jiang Huang could cause heat and dryness in the body that might aggravate arthritis ultimately. Mu Gua (papaya) and Yi Yi Ren (Job’s tears) are often added to the previous formulas for joint deformation. They are also very easy to use as dietary support or food therapy. They help drain the swelling from the joints and alleviate pain and spasms. Du Zhong and Xu Duan are guiding herbs for arthritis to the lower body, from the low back down to the feet, harmonizing the immune system and relieving pain. Chinese herbs are gentle and effective with fewer side effects than Western medications. RA is a serious medical condition which requires comprehensive diagnosis and supervision by a physician. The herbs and formulas listed above should be prescribed by a TCM herbalist who can tailor the formula for your body and underlying conditions. Acupuncture, Tai Chi, and food therapy are excellent additions to the herbal formulas to help relieve the pain and symptoms of Rheumatoid Arthritis. Dr. Dongfeng Zhou, AP is available for herbal and acupuncture consults at our wellness center in Margate Florida. Give us a call today to get started! Borden, Peter. “Mu Gua – Chinese Quince – Chaenomelis Fruit – ‘Wood Melon.’” Chinese Herbal Medicine, Peter Borden, DOM, 16 May 2013, chineseherbinfo.com/mu-gua-chinese-quince-chaenomelis-fruit-wood-melon/. Dharmananda, Subhuti. “An Analysis of Chinese Herb Prescriptions for Rheumatoid Arthritis.” Institute for Traditional Medicine, ITMonline, August 2000, www.itmonline.org/arts/arthritis.htm. Ellis, Andrew. Notes from South Mountain: A Guide to Concentrated Herb Granules. Thin Moon Publishing, 2003. Huang, Kee Chang. The Pharmacology of Chinese Herbs. 2nd Edition ed., CRC Press, 1999. Kecskes, Alex. “TCM Approaches to Relieve Arthritis.” Pacific College of Oriental Medicine, 18 Dec. 2017, www.pacificcollege.edu/news/blog/2014/10/19/tcm-approaches-relieve-arthritis. Shi, Anshen, et al. Essentials of Chinese Medicine: Internal Medicine. Edited by Leigh Caldwell, 2nd edition ed., Bridge Pub. Group, 2011.